It’s that time of year when many of us travel over the holidays to be with family and friends. If you normally board your dog or hire a pet sitter, why not consider taking him along this year to celebrate the holidays with you? Traveling with a dog is easier than it used to be. From finding pet friendly hotels and restaurants to locating dog parks and veterinarians, there are several apps and websites that can make a holiday road trip with your dog a walk in the (dog) park. I’m often amazed at how easy it is to travel with Haley, but I realize many dogs aren’t crazy about extended car rides. Although they enjoy a change of scenery, the change in routine can sometimes leave our pups a bit stressed. Use the planning, packing and travel tips below to make sure your road trip proceeds without a hitch! Consider microchipping your dog if you haven’t done so already. Dogs can become easily disoriented when away from familiar surroundings. If your dog ever gets lost, a microchip offers the best chance of reuniting with him. Check with your vet about any required vaccinations or medications before your trip and obtain a copy of your dog’s health/vaccination record. If your dog is new to traveling in the car, take a few short practice trips close to home before it’s time to leave on your road trip. If your dog doesn’t already know a potty command such as Go Pee or Hurry Up, start training a few weeks before leaving for your trip. 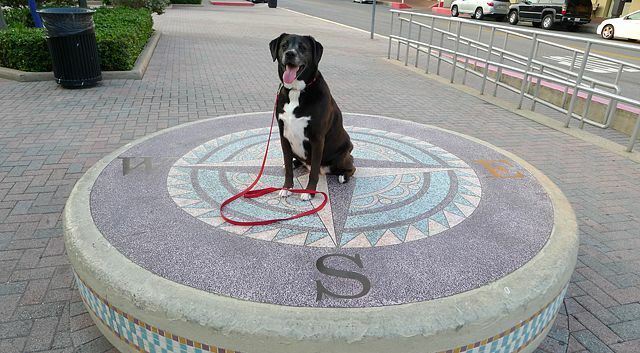 Always make sure your dog is welcome at your destination, whether it’s a hotel or relative’s home. I have to admit, I like to keep it simple and I’m not one of those people who like to pack for every possible scenario unless we’re vacationing on a remote island or similar location. I especially hate carrying all kinds of puppy paraphernalia into a hotel for an overnight while on the road, so this is a must-have list. Dog Food – A dog’s gotta eat, right? Pack a little more than what your dog normally would eat in case your plans change and extra food is needed. Water – Take enough water for on the road and extra water if you’re traveling in remote locations. Food and Water Bowls – A bowl with a water-tight lid is ideal for car travel. Collapsible bowls are convenient for packing and for use at your destination. Collar with ID Tag – Make sure your cell phone number (or current contact information) is specified on the ID tag. Use a waterproof marker and tape to makes changes if necessary. Leashes/Harness – It’s a good idea to have more than one leash. Leave one in the car so it’s always available for use while on the road. A long leash is handy when your dog can have a little more freedom and a short leash is perfect for mingling through crowds or when you need to keep him close to you. Night Light – Clip-on LED lights are ideal for making sure you’re visible when walking with your dog at night or locating your dog outside after dark. Crate – Portable crates are nice to have when traveling. Many are lightweight, easy to setup and don’t take up a lot room when collapsed. Crate Padding or Bed – Every dog likes a comfortable place to lay their head and a pad or bed that fits inside the crate can save on packing space. Toys/Bones – Pack several of your dog’s favorite toys and a bone or two. Treat balls can double as toys and food dispensers. Treats – Treats are especially useful for coaxing your dog to cooperate when you ask him to do things he’s not used to doing while on the road. Reward him for being a good traveler. Blanket or Seat Cover – A thick quilt or heavy blanket will protect your car seats from getting scratched or dirty and will protect your dog from being burned by hot seats in the summer. Blankets can also be used to cover valuables in the car. Towels – Absorbent microfiber towels are great for drying a wet dog or cleaning up spills. They’re lightweight and easy to pack. Poop Bags – Take plenty of bags and keep an extra roll in your glove box. License and Vaccination Record – You may be asked to provide these, especially if you need to board your dog in case of an emergency. Grooming Supplies – Combs, brushes and any supplies required for regular grooming. Paper Towels/Dog Wipes – Good for quick and easy clean-ups. Picture of Your Dog – If your dog gets lost, you’ll have a picture for printing flyers to help identify him. Dog Travel Bag – You’ll need a bag to store all these supplies while on the road. Specialty dog bags, beach bags or diaper bags are roomy and have plenty of pockets and compartments to keep things organized and you’ll have all your dog’s supplies together in one easy to carry bag. Before leaving on your trip, check out the post 10 Tips for Keeping Your Car Clean to help prevent your vehicle from becoming a muddy furmobile while your travel. Decide where your dog will ride during the trip. Travel crates that can be secured in the car or harnesses with seat belt clips will keep your dog from roaming around the vehicle. Make sure he’s able to ride and rest comfortably. SUVs are very dog friendly vehicles and perfect for long trips. Don’t allow your dog to ride in your lap or in the front seat of the vehicle where they could be a distraction or be injured by an airbag. To avoid injuries or respiratory problems, don’t allow your dog to ride with his head outside the window. Keep the temperature comfortable for your dog. Make sure it’s not too warm in the back of the vehicle and use a sunshade or portable crate fan if needed. Stop every few hours to allow your pup to stretch, drink some water and have bathroom break in a grassy area. On long trips, locate parks or dog parks along your route for longer walks or exercise. If your dog seems anxious or is panting, whining or acting restless, he’s probably telling you he’s ready for a break. If possible, schedule rest breaks so you can feed your dog on his normal feeding schedule. Pack your dog’s travel bag in a convenient spot in the vehicle so you can easily reach supplies when needed. Eating on the road doesn’t have to be limited to fast food drive-thrus. If the weather is nice, look for restaurants with pet-friendly patio dining or get some local carry-out cuisine and head to a nearby park for a picnic and some exercise. Never leave your dog unattended in a vehicle. We’ve all read too many stories of dogs dying from heat exhaustion when left in cars during warm weather. Be careful when opening vehicle doors. If your dog isn’t trained on door manners or to wait for a command before exiting, secure him on a leash before opening the door, then open the door slowly to make sure he doesn’t bolt out of the vehicle. If your dog experiences car sickness, feed him a few hours before traveling and give him small amounts of water and/or ice cubes each time you stop. Keep the car cool and well ventilated with fresh air. If possible, position the dog so he’s facing forward rather than looking out of the side or back windows. 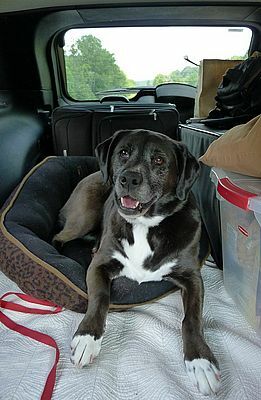 Exercising your dog before traveling is a good way to help him relax and rest while on the road. Use websites and apps such as BringFido, GoPetFriendly and DogFriendly to help locate pet friendly hotels and other amenities while on the road. Before you hit the road, double check that your hotel is pet-friendly. Don’t rely on a website description since hotel policies can change. Also check for restrictions on breeds and size and if there are any additional fees for pets. If your dog requires refrigerated food, make sure your hotel room has a mini-bar. 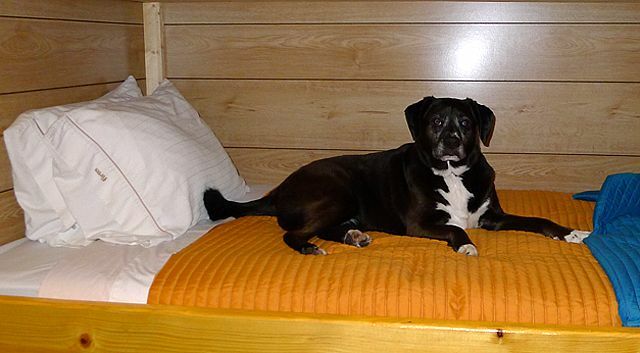 Find a quiet, safe spot in your room for your dog’s crate or bed. Never leave your dog unattended in a hotel room. Even if your dog is in a crate, he may whine or bark for hours because he’s been left in an unfamiliar setting. Be respectful of other guests, not everyone likes dogs. A pet-friendly hotel doesn’t mean your dog is welcome everywhere inside the hotel, especially inside restaurants or at the continental breakfast bar. If your dog is a heavy shedder or likes to sleep in bed with you, bring along an extra sheet to help protect the hotel bedding. Always clean up and pick up after your dog. Never show up with a surprise doggie houseguest. Make sure your dog is welcome and that they get along well with any other pets in the home. Check with your host about where they would like you to keep food and water bowls. Keep your dog on a leash or in a crate when necessary, especially if your dog is a dinnertime beggar. If there are cats in the home that get stressed around dogs, give them a break by crating or leashing your dog occasionally. Inspect the yard for any safety issues such as holes in fencing and always accompany your dog when he’s outside. If your dog sheds, groom him daily to avoid having excess pet hair in the house. Try not to leave your dog alone for long periods of time and crate your dog if you leave the house. Leave your host a thank you note and small gift as a thoughtful gesture for allowing your pup to be a guest in their home. With all the hustle, bustle and merrymaking around the holidays, it’s easy to forget that our dogs may need a little extra TLC. Travel, lack of adequate sleep and the change of environment is stressful and can make even the sweetest dog a bit cranky. Try to stick to your dog’s routine as much as possible and occasionally take a timeout from the festivities to relax or take a long walk together. If your dog seems overloaded by all the excitement, some quiet crate time can help him relax and get some well needed rest. Going on a road trip with your dog requires a few sacrifices along the way, but there’s nothing like having your best friend beside you for the ride. Are you planning on traveling with your dog over the holidays? Share some of your helpful travel tips with us! Wow – what a great resource for anyone traveling with their pets. Much appreciated. Going to share. Thanks Slimdoggy, we’ve done a lot of traveling with Haley and it’s always great having her along. Thanks for sharing! Yeah, I’m with SlimDoggy. That is a very thorough list. If you made it into an infographic (there are free programs that can help you do this), you might get more shares. I’m off to post it on Facebook. And I’m with you–traveling with dogs it the best. I’ve even done it with reactive dogs and everyone had a great time. It just takes a little more management. Excellent tips. I have been meaning to do a post on tips for staying in a hotel with pets because we do it a lot. 🙂 I would add a first aid kit to your list and info about ER vets at your destination or any places you may be staying. We have also found that it is better to bring water for the entire trip because sometimes strange water can cause tummy upset and who needs that? Great tips! Some dogs are sensitive to different water sources. I look forward to your hotel tips post in the future. I’m sure you have a lot of good advice from your travels with the brown dawgs. That was fantastic and very thorough! Wonderful for someone traveling with their dog for the first time and a great reminder for those of us who do it all the time. My only question is with the advice to “never” leave your dog alone in the hotel room. Many hotels have this policy, but some don’t. When we travel as a couple with our dog, we don’t have a choice but to leave him in his crate for short periods of time unless we don’t want to do anything together (like go to breakfast in the hotel, for example). Luckily Richie is used to his crate and doesn’t tend to bark, but I’m in favor of choosing a hotel that allows dogs to be left unattended for short periods of time. We’ve actually decided to road trip to CO for X-mas so that we can bring the dogs with us (yes, I’m crazy). Luckily, everyone is more than welcoming to Lola and Rio. Here’s hoping for good weather! That’s awesome you’ll have the dogs with you at Christmas and everyone will be happy to see them as well. I hope they enjoy the road trip and the weather stays nice while you’re traveling.